It’s that time again. The time you’ve all been waiting for since this same time last week. It’s name this flower time! I swear I just heard about 100 of you giggle with glee. OK, well, I was fantasizing again, but it never hurts to dream big. Here is the flower . . . There will be two prizes awarded for this flower. One for the person who tells us the common name in English. The other for the person who can tell us the local French name. I will give the translation and explanation after this has been done! If I tell you what the prize is, it will make the guessing too easy! My sister, Heather, is exempt because this photo was taken on our last weekend get away. Contest ends when someone comes up with either the correct French or common name for this flower!!!!! Could be days and days and days! I don’t mind! I have time! HINT: It is an aquatic with very large leaves. The flowers can range from white, to cream, to yellow. Contest Over! We have a winner! Rocky says: C’est une graine à voler. He is absolutely right. This is what bayou people call “graine à voler”, which means “seeds that fly”. The common name (you were very close, Kim) is American Lotus. If you look closely at the photo, you will see a green seed pod in the background. That flower has matured–the petals have fallen. The seeds are edible, and Heather and I actually ate some green ones from these particular plants. There is nothing to compare the taste with, but they were palatable. and the pod releases the seeds and they “fly” out into the water; hence the name. This seedpod is now Rocky’s prize! Maybe he can release them in a pond near his house to propagate more of these lovely flowers. Thanks for playing the game, and I hope at least one of you learned something new! Okay. You’re assuming that I can remember the name! What *is* that little guy? Welcome Steph!!! I can’t tell you, that would be cheating!!! You need to submit a guess! Okay, I can’t stay away. This was bugging me too much and I actually had more time to look. I have a hard time telling if this flower is white or yellow….but you said it was yellow so my best guess is a yellow lotus lily. I have no idea what the french name would be. Kim, you have the lotus part right! I need one more word in front of that word to make the common name correct. You are so very, very warm! C’est une graine à voler! People used to eat the seeds or something. 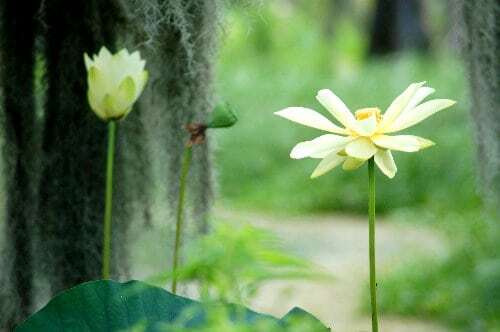 One more try…………common yellow lotus lily? 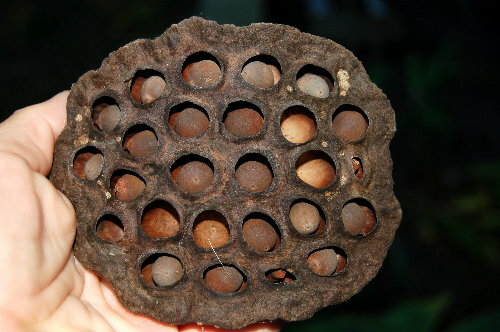 I have seen those seed pods before and never knew what they were. So, I learned something new!